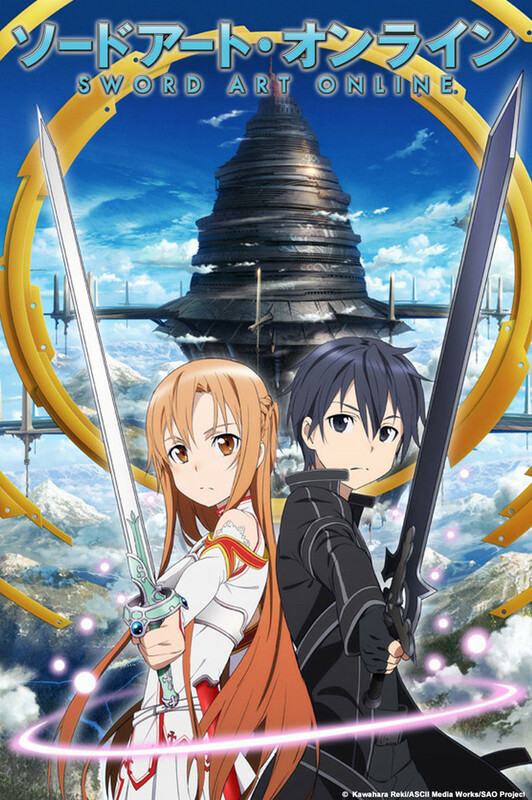 Synopsis: In the year 2022, virtual reality has progressed by leaps and bounds, and a massive online role-playing game called Sword Art Online (SAO) is launched. With the aid of "NerveGear" technology, players can control their avatars within the game using nothing but their own thoughts. it is one of the best anime's iv'e seen and iv'e seen alot like almost a 1000.
i have only watched the 1st episode and it's amazing!! i hope it stays awsome. i'd say anyone who liked .hack would like this even more. I've watched the first two episodes now and I agree with you. So far, this is a great anime and I'm hooked. As long as it keeps going the way it has through the first two episodes its bound to be a good one. Yeah it seems pretty good so far i liked the battle in last episode it was done well, hopefully they'll keep it interesting though. Yeah, it was good. I like how they integrate gameplay into fighting and the way they form teams. It makes up for the fact that you have regular people having to fight. There's books?! I'm undecided whether I should pick this up since I dislike watching weekly stuff. is it that good? Come on, I'm going to have to check the books out. Thanks for the link. Seems like another side story... really it would tick me off that their doing a bunch of side stories from the light novels if they actually weren't so good. Enjoyed episode 4 quite a bit, but really looking forward to getting back to the main storyline soon. PS. The books/vn/ln whatever they are, are awesome too, very interesting storyline indeed! Watched the first episode and loved it! If it's anything like the light novels, I'll look forward to it. It's a good RPG Anime! I guess it would be nice if there was a PC game about it. Just finished episode 6... must say I liked this side story better then the last just because it had a bit more technicality about it. One more side story then on to the main storyline... oh happy watching lol. Oh I know lol. But one of my friends had said they were working on a game based on SAO. Not sure if it's true or not but I would love to play it. SAO is my new favorite anime. Sword Art Online seems like it could be good, if only they'd get to the heart of the story and quit jumping around. The premise is, they join a virtual reality MMORPG on launch day, but it's a trap. They're stuck in the world and can't get out till they beat the game. If they die in this world or someone tampers with the neurolinker in the real world, they die for real. To beat the game you have to go through 100 floors and beat the boss on each level. Problem with this is, episodes 2-7 are just fluff. They're extras from the light novels that have been thrown into consequential order for the anime. However they're not back to back, and the actual manga seems to have skipped over two years. So, episodes 2-7 are simply side-stories with almost nothing that'll affect the story. To make matters worse, they've already skipped over 2 years of story and are already around floor 70. I hadn't read the manga, but I'd have hoped they would have fleshed it out better and not skipped so much. Now, with episode 8 we're finally getting back on track. However more than half of the floors have already been beat. So we'll see how it goes from here. Hope we at least get flashbacks of stuff that was skipped. Wait what? That would be the equivalent of Lord of the Rings jumping straight from the Council of Elrond to the Siege of Minas Tirith. Not sure if I'd want to watch a series that skipped that much.